That’s what comes to mind when I think of W.A. Frost. Yesterday, we celebrated our anniversary on the patio with a garlicky, spicy, delicious lunch of mussels and Muscadet. Mmmmm, except only the manager had the keys to the cellar and our server couldn’t find him. Then the wrong glasses (a hint) followed by the wrong wine were brought to the table. When the manager and our too warm bottle of Muscadet were located, my husband had to gently remind the server to exchange our wine glasses from big Seghesio-style glassware to a more Muscadet friendly glass. (This is View #1). Never emphasize something with your marketing that you can’t deliver. Monday’s wine special? Half off all bottles of wine priced $40-200 and publicized on the menu. We opted for a less expensive wine, but I’m wondering if anyone else on the patio had to wait for their bottle. Tuesday’s special? It’s a free glass of 99 Vines Pinot Noir via Frost’s Posterous site, which I read on their Twitter feed. 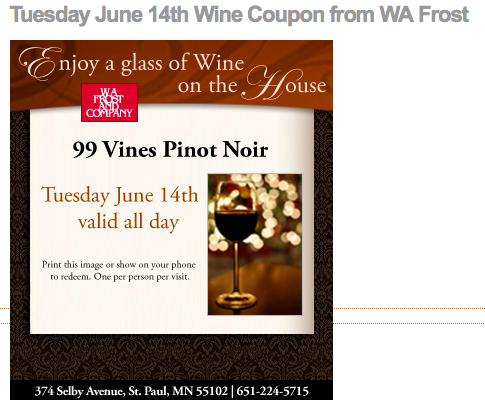 What a great idea (this is view 2) to bring customers in on typically slow day of the week with a smartphone-friendly web coupon. Let’s hope they can find it. Okay, that was snarky, but pretty funny, too. Promote what you have and do well. Don’t irritate a former professional wine geek celebrating her anniversary. I was lucky enough to get a free glass of the cheapest house chardonnay with a facebook coupon on a Tuesday.